CONGRATULATIONS!!!!!!! Very good. That was not easy. They are called seeds on most of the websites I visited. We have numerous plants around the property and I learned last year that they are the kind that can be used for spices...StagHorn. The flower heads are slightly sticky and at this time of the year they don't have a lot of bugs in them. This is a new experience for me. I decided to harvest a few of the fresh looking ones. I stripped the seeds off the flower heads and put them on an Excalibar Dehydrator matt and popped them in the dehydrator at 135 F. I think they should be dry over night. 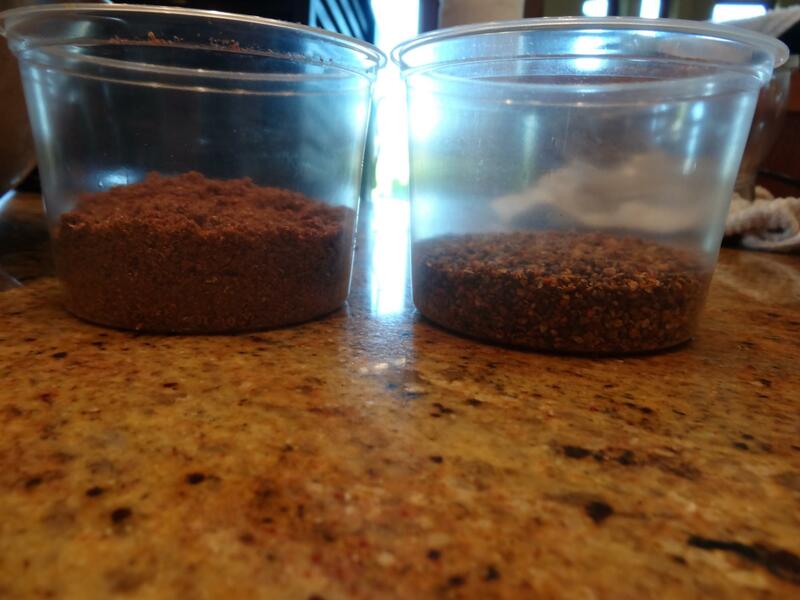 To my surprise, and dismay, one cup of raw sumac seeds will only yield 1 1/2 teaspoons of the sumac spice. I thought it was the seeds that is the spice, but no, it is the covering flesh of the seed that is the spice. 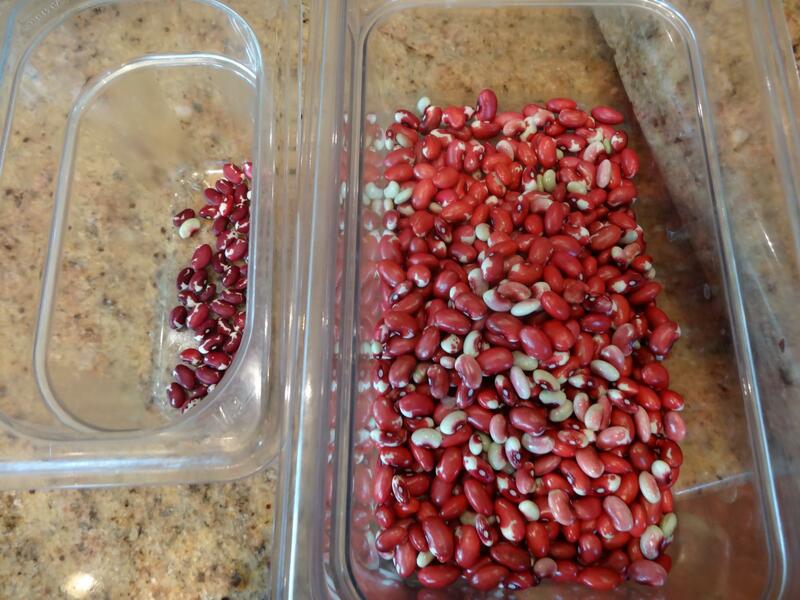 So, once they have dried I will put them in a food processor and try to separate the flesh from the seeds. 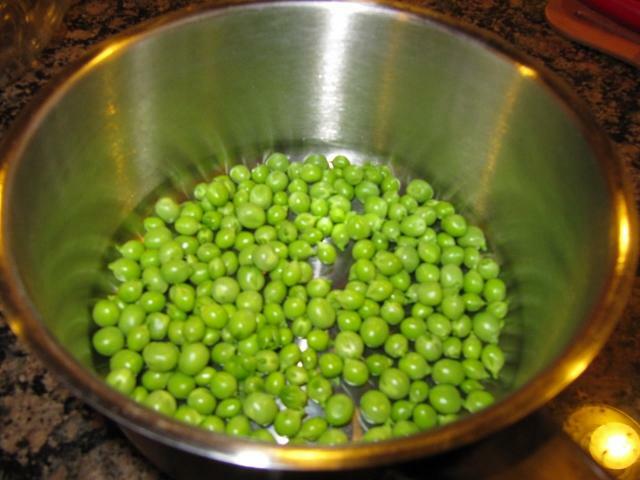 I will put them in a strainer and try to extract as much of the flesh from the seeds as possible. That's the instruction from several websites including Serious Eats. Once I learned about the low yield I went back outside and cut off all the new growth flowers I could reach and have put them in my green house to dry and to allow the bugs to crawl out. Once they are dry then I am sure the seeds will strip away from the flower stem much easier than what I did today with fresh flower heads. 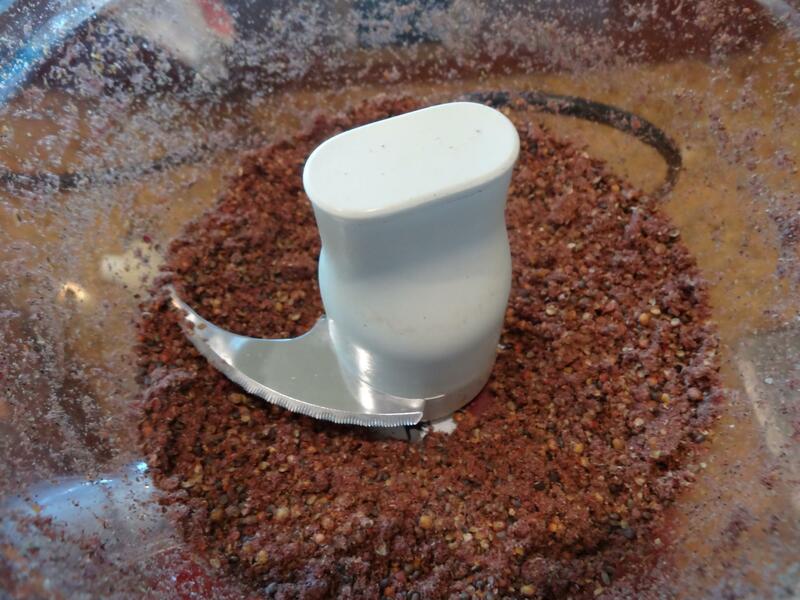 Then all I will need to do is put in the food processor, etc. Here is a picture of the fresh flower heads from earlier today. Wow! Such a labor of love! I admire all the sincere cooks who went through this process. And you for trying. I will remember that wheb I use it next. So I bought a packet of sumac and one of zataar and have been trying to use them in mediterranean dishes. So far sumac goes well with hummus and sprinkled on falafel or the lettuce tomato and bread salad (I forget the name). Zataar I have not been able to use yet. Any suggestions? Thank you for the pasta praise! Well, the processing was way easier than I had envisioned. 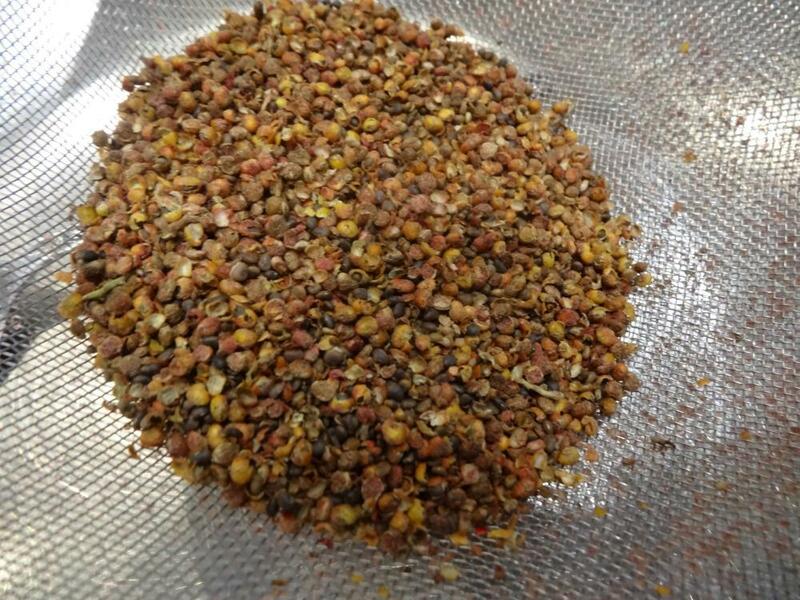 The yield prediction of 1 cup of sumac seeds to 1 1/2 teaspoons of sumac spice is BS. 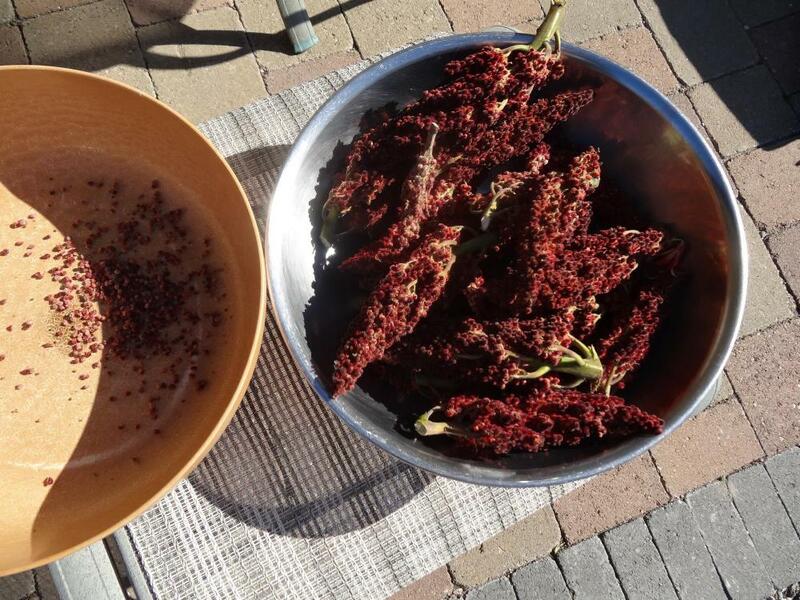 First picture is my yield, sumac on the left, seeds on the right. The sumac is quite fluffy. It was very easy to separate the seeds from the 'flesh'. Second pic is in the processor. Third pic is the seeds. 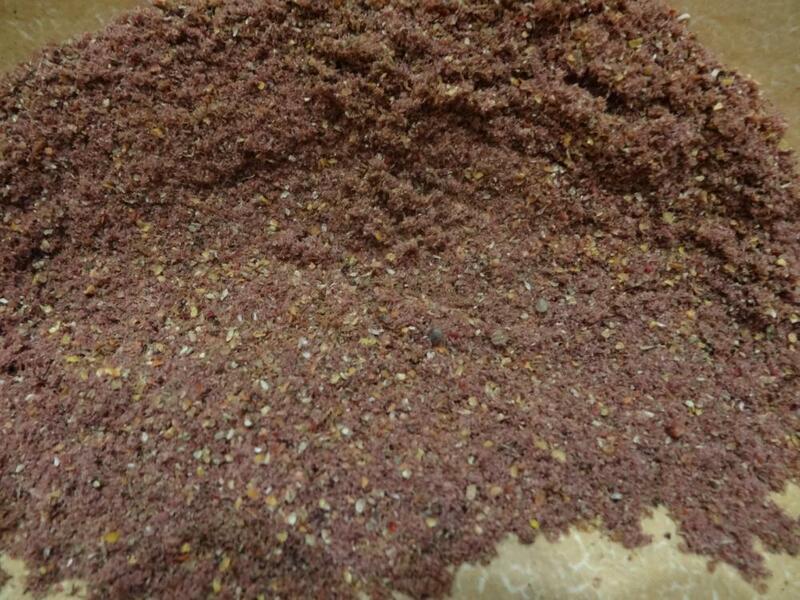 There are any number of recipes using sumac. Typically used with lamb, chicken, shrimp. Mixed in a yogurt sauce, etc. Just do some googling. Or if you like middle eastern food I highly recommend Persiana the cookbook by Sabrina Ghayour. She has 13 recipes using sumac. I will do some shrimp tonight: Shrimp with Sumac, Cilantro, Lemon and Garlic. Make the marinade: 6 T olive oil, zest of 2 lemons and juice of 1/2 lemon, 2 Tablespoons sumac, 5 garlic cloves sliced thinnly, 20 grams cilantro finely chopped, salt, pepper, 800 grams large shrimp. Marinate the shrimp for about 30 minutes. Shake off the marinade and grill or fry the shrimp. Can't wait. It's so sad. Slowly working on the boxes. Weeding and turning over the soil. 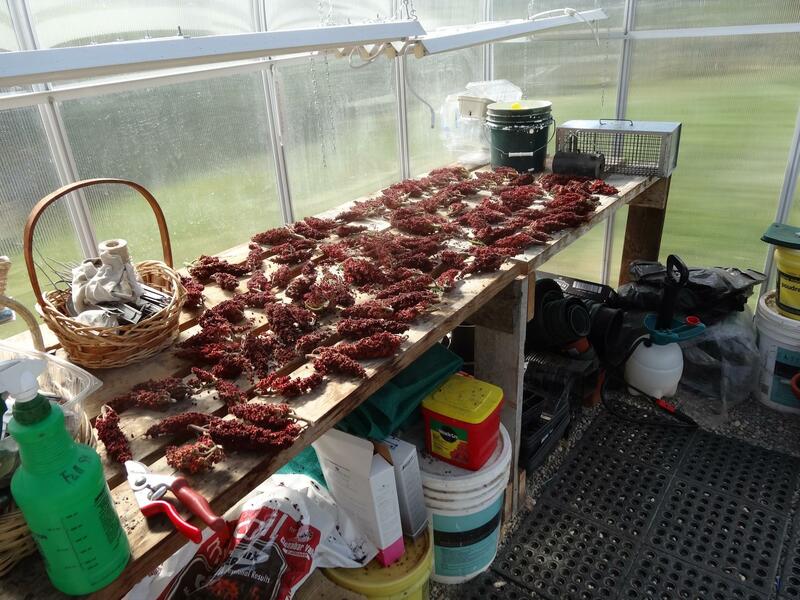 The rest of the sumac flowers drying in the greenhouse. Maybe our Syrian Family would like some once they are dry. Newsflash: Born unto our farm yesterday morning- a new yard romper - garden stomper.....His name is "Fluffy"..... Yes, Fluffy the baby BULL. You'll have to zoom in to see him. His Momma won't let humans too close. Naming a macho bull "Fluffy"
My 4th grade daughter did that. Personally, I was pushing for Manny or Sid. That goofy name thing doesn't happen to all the animals....the Daddy bull has a much more macho name: "RedBull". Over 2K pounds now. What a beast!!!! I suspect he won't grow up to be a macho bull. 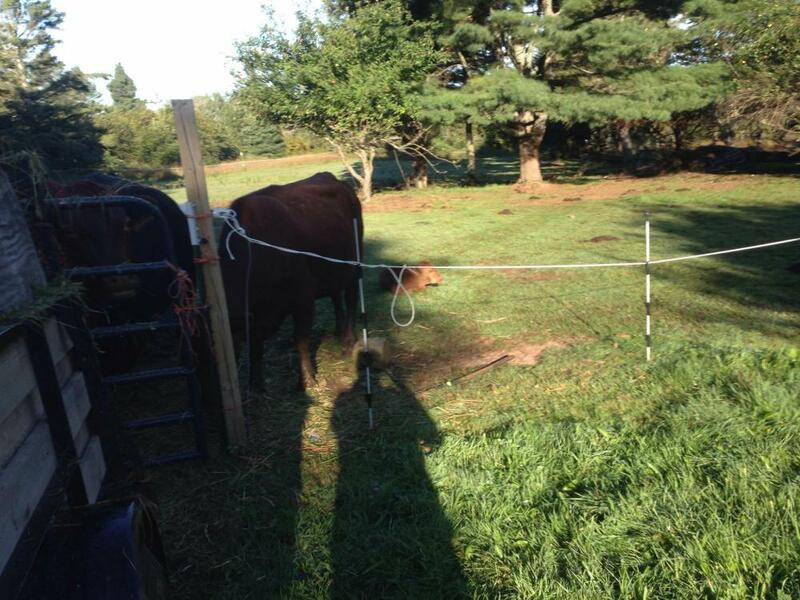 They didn't stay bulls long on our farm. A steer suits much better as a "Fluffy." Beggars can't be choosers.....I'm getting some (very) small tomatoes. This is my biggest harvest this year (sigh). They don't taste quite....right. I can't describe it. 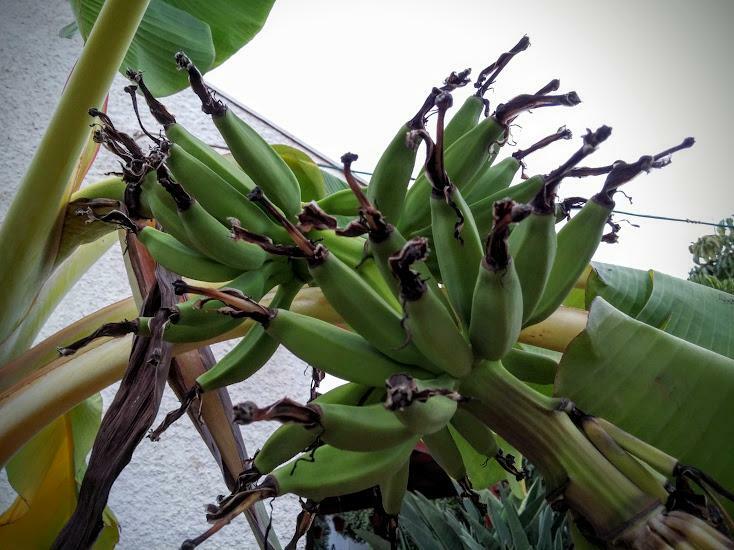 I know it has to be the lateness of their ripening. They are still good, though. 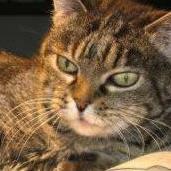 Gorgeous, Shelby!!!! You have way more tomatoes ready than I do! I get 2-4 a day, maybe. Somedays, none. My zucchini and crooked neck are going crazy, too. If I find an unlocked car in my driveway- look out! The AT&T guy almost got it yesterday. He wouldn't go in the house, so I couldn't pack his truck and run without getting caught. darn! I uploaded a ton of photos and just realised it was too much, so have a status report instead. The herb border is progressing fine - everything looks like it will overwinter, my ailing rescue bay tree is back to normal, the swiss mint is very happy. Berry patch has not harvested apart from a few from the lingonberries, which look very happy. Everything was tiny though and the cranberry is clearly happy. Might move the aronia next year but a year establishing will not hurt them. Flower bed is going crazy, I have been cropping more cosmos and cornflower than I could ever use since June and they are still going. Scabious are not worth their slot. Nigella are if you don't consider other crops but crop at the same time and never got used. I am growing them on for winter interest in a seed pod display. Wouldn't bother again. Sweet pea are terrible. I suspect I need an earlier start and more organic matter. 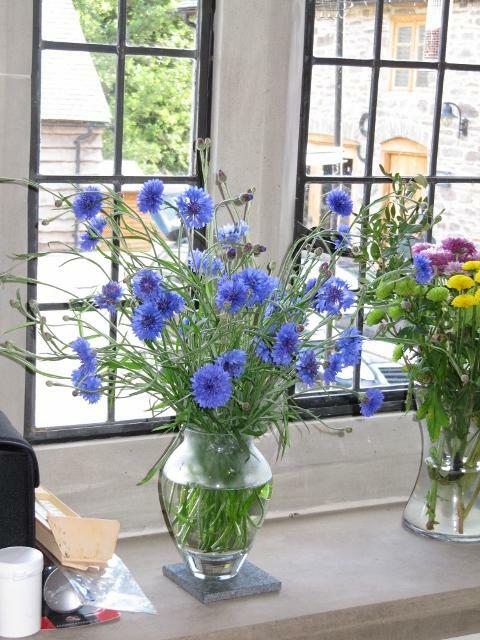 Asters are a surprisingly good value crop. Nasturtiums got ravaged by Cabbage White caterpillars but the seeds (which I was growing them for) are reclaimed and pickled. Next year I might use more leaves in salads. Sunflowers - I have 7, the size of a good sized dinner plate. The problem is how to harvest. Right now they are clearly not ready, the seed is not full. It is a F1 but it is supposed to be a seed friendly F1 (little dorrit) and the current wisdom is to encase the heads in cheesecloth and let them drop naturally. A couple of the heads have mould so I am worried about this but I might as well try it as instructed this time. I am just sad if it doesn't work, I could have had an epic Van Gogh bouquet. 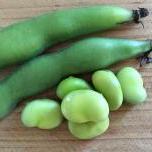 We planted 6 runner beans this year and need at most 3 - I think we have gotten one meal out of them fresh and everything else has gone in the freezer. Less next year and probably I need to research recipes. I also need to pick them again, arggh. Courgette are the same - next year plant fewer plants but probably in neat manure / compost. Check more frequently and don't be shy to harvest small ones, the 2 foot marrow that got away (and is the basis for at least 10 meal portions) will appear regardless. Cornichon are just too random to be useful. I've just pickled a 6 inch long example with 10 2cm long examples. I think, for the times that I really want a Viron style baguette with pate de Campagne, cornichons, leaves and salad (it used to be a Saturday morning pick from an amazing baker in Tokyo, with their Coppa - I can still taste it) I should just find a supplier for decent cornichons. Drying beans got used just off dry in a slow cooked lamb dish that was essentially 8 hour locavore organic hogget (excluding the abattoir trip, it's from 400 yards away). It was tasty enough but not mindblowing. I'd rather give the room to something else. I need to feed the fruit cage - the imported soil is stone free but a bit too sharp. Top dressing with manure and probably some pellet plugs. £5 fruit trees were never going to crop this year. Cox apple is looking happiest, morello cherry the least happy, pears and plums in between. It was £30. We can see. Need to pick 2 figs off the tree in the Mediterranean garden. Oka is doing well, lovage has perked up and I think will establish. Rhubarb crowns are wildly happy at being out of the pot. I am in the process of moving my plants inside as lower temperatures should arrive soon here in the NE /NJ. Most of them are Orchids and C&S but there are a few edibles which I keep going through the Winter. 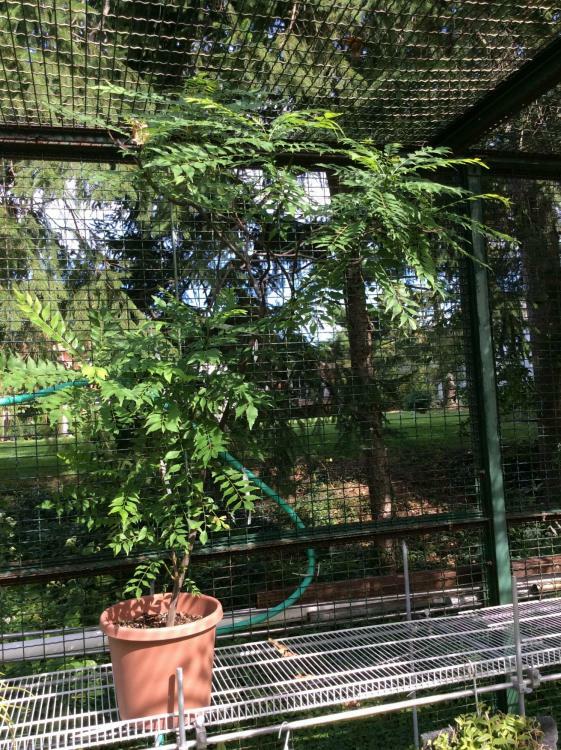 I have been keeping this Murraya koenigii /"Curry plant" for many years now and despite trimming/using it this Summer a couple of times, it is a nice little tree, ca five foot tall. 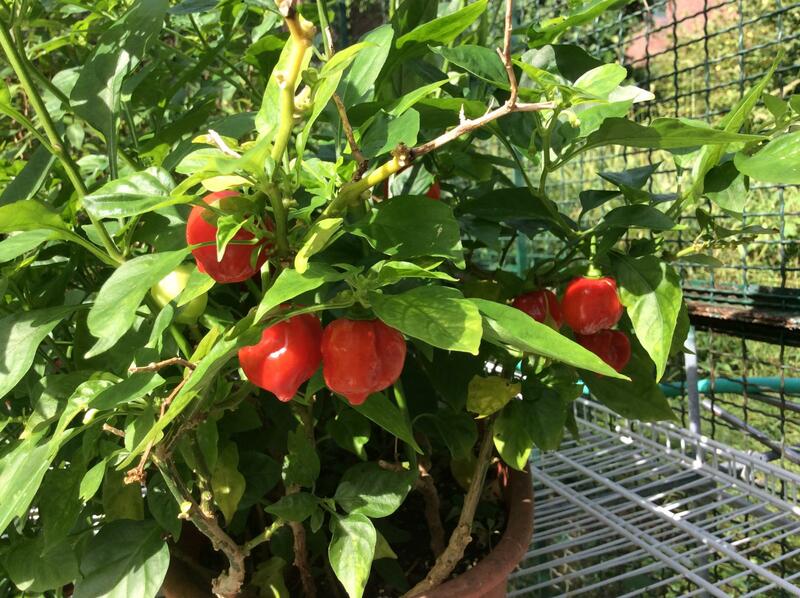 And there is the Carribean red habanero, which I seem to have inherited from my son a few years ago, to be handled with care! One little pepper will spice a pot of Chili nicely. 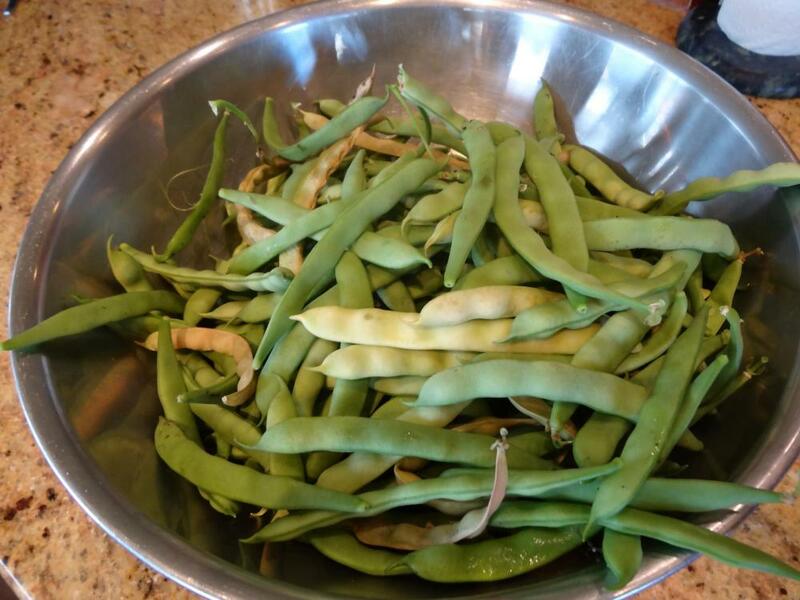 Here are my shell beans before and after shelling. They are beautiful. Some of the smaller ones I will try planting next year. 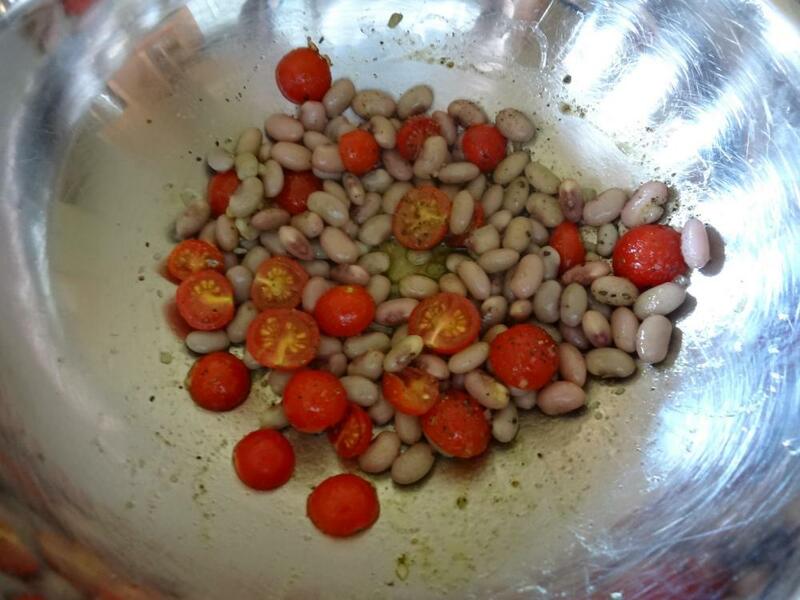 I cooked all three cups that I harvested and made a bean and tomato salad with basil infused oil. They are really, really good. Too bad they don't stay red when cooked. My herb garden on the front deck at the beginning of fall. We've had some unseasonably warm weather in the past week, so this garden is good to go for awhile. 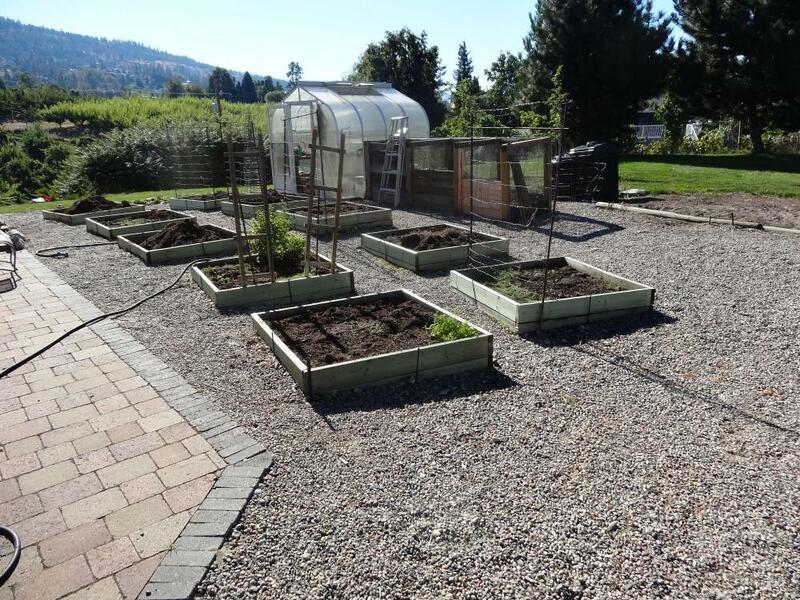 On the left side of the pic, purple-flowering Thai Siam Queen basil and alpine strawberry (Fragaria vesca 'Mignonette'). I grew this variety of alpine strawberry for the first time this year, and I was very pleased with it. 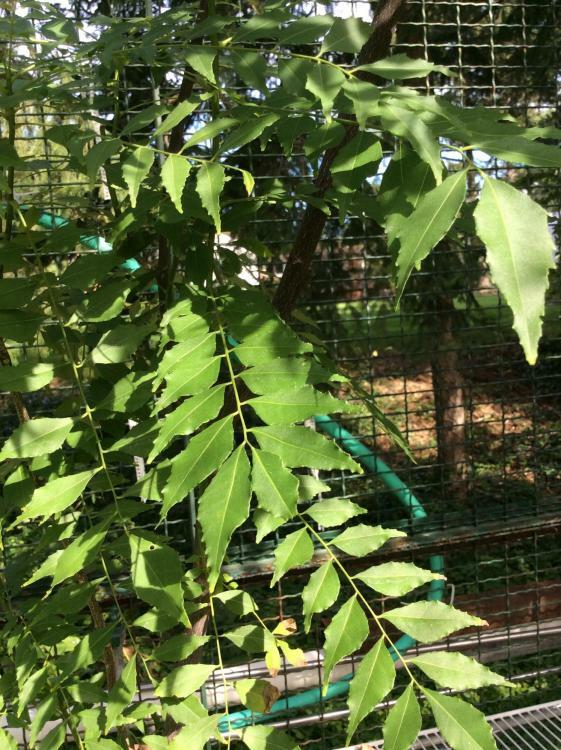 It's a no-fuss plant with a steady supply of berries through the summer, and it's still bearing now. The berries are intensely flavored, like the essence of strawberry. Also visible in the pic, Marseilles basil, Spicy Globe basil, Genovese basil, French and English thyme, tarragon, marjoram, creeping winter savory, and Italian parsley. On the right side of the pic, spiky purple flowers from Herbalea Wild Magic basil. 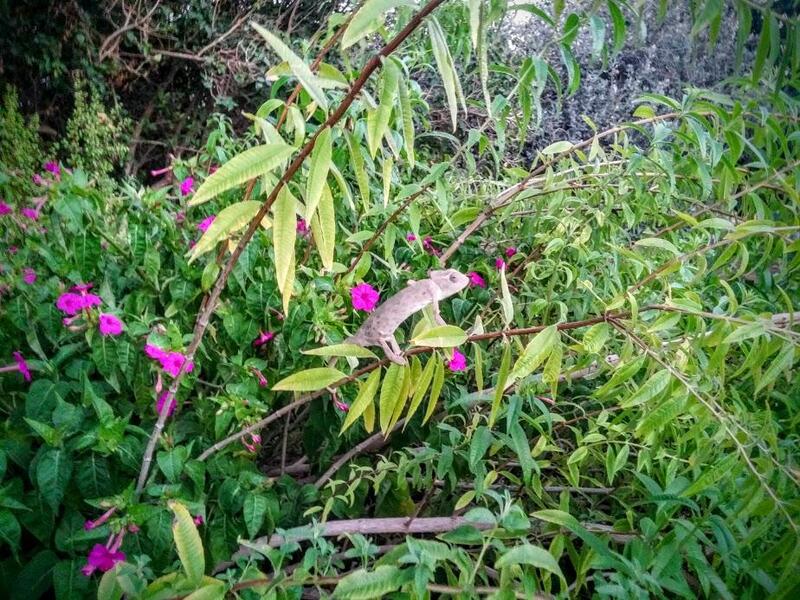 It has grown large and taken over its corner of the garden. Of the basils I tried this year (my post 7/17/16), I'll definitely grow Spicy Globe basil again. It tastes fantastic in spaghetti sauce. Genovese basil is a perennial favorite; it will show up next year. Marseilles basil has a mild flavor that's fine for salads, but I don't use it for cooking. I probably won't grow Marseilles again. (But a friend who tried this basil really liked it.) Of the two purple basils I grew, Thai Siam Queen and Herbalea Wild Magic, I prefer the flavor of Siam Queen. Wild Magic tastes OK, though, and it is...wild. 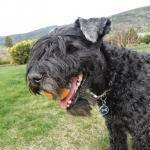 A prolific grower, no-fuss, with a tolerance for cooler weather. It's still going strong into the fall. A nursery person told me that I didn't have to clip the flowers off Wild Magic. This basil is sterile and doesn't grow seeds, so the flowers don't use up too much energy from the plant. The flowers have a strong fruity scent, very pleasant, and bees love them. I may grow Wild Magic next year as an ornamental. 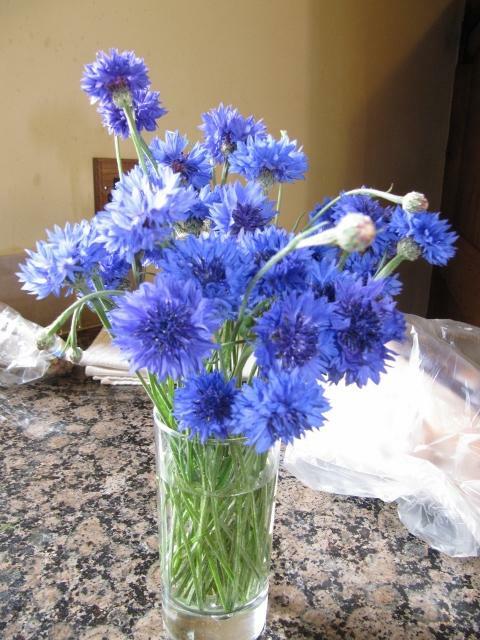 Since I saw this got a like, the cornflowers are still going happily now. Meeting mum for lunch tomorrow and will do a huge pick for her. She loves cornflowers. Might even go till the first frosts! Back from 3 weeks in Italy. I thought I had a picker volunteer while I was gone, but no evidence of it. I feel lucky to have been able to pick this today. 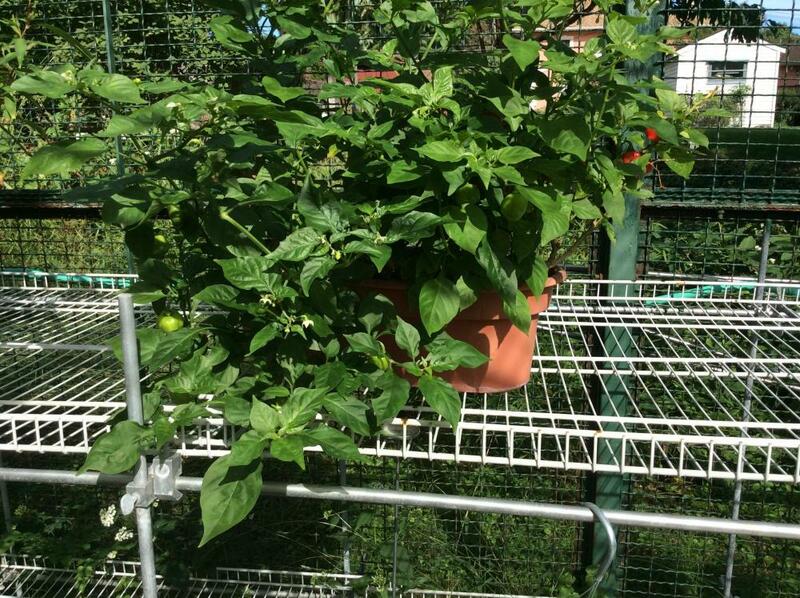 Things are winding down quickly, except the shishto peppers are heavy with fruit and blossoms. It looks like the weather was friendly while we were away. Fingers crossed to have fresh silver queen from local farms 1 or 2 more times this season. I recently bought a new freezer and have been putting a little away for the winter each time we have it with dinner. Welcome home, Chris! I sure enjoyed all of your pics during your trip. I, for one, would love to see pictures! I've envied your garden all summer. I had a weird thing happen with herbs this year. When it got hot and dry, my herbs (basil, cilantro, tarragon, chives, parsley, rosemary, sage, lemon verbena, a few others that escape memory right now), they all up and died on me. ALL of them, including the rosemary (which I am MOURNING, as I am used to being able to harvest it all winter). I am not certain if it was the uber-hot spell we had in July and early August, or if the lawn guy got enthusiastic with his weed treatment and it drifted into my herbs (which are pot-grown, and lined up along the sidewalk that no one uses, leading to the front door, which no one uses). I suspect the latter. 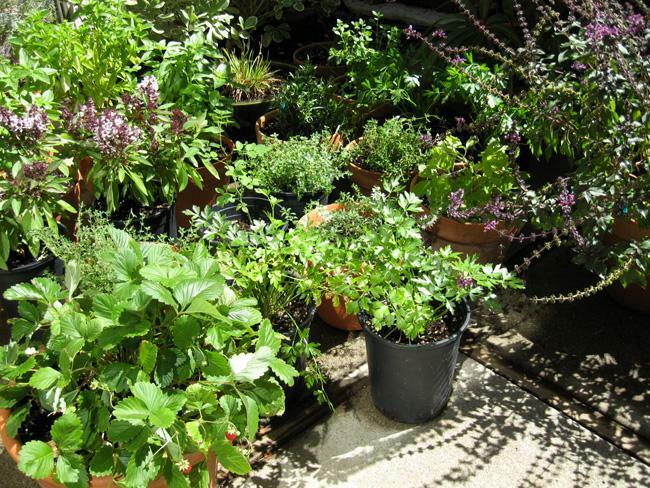 But for future reference, in climes where midsummer daytime temps hover in the upper 90s for two months or more, should my herbs be in pots that have full sun exposure from about 11 a.m. until late-late afternoon (easily 6 p.m., maybe later)? @kayb, maybe your herbs didn't get watered enough when you were recovering from your injury? In the kind of weather you describe, pots can dry out really quickly. I'm sorry about your rosemary. I can always walk a few minutes to the neighbor's place and get some from her HUGE shrub year round. I mean this thing is over four feet in diameter and nearly as tall. She's kind to give me carte blanche with it, but there's no way one household could use all it offers up. It is planted in the ground and has been very hardy here.